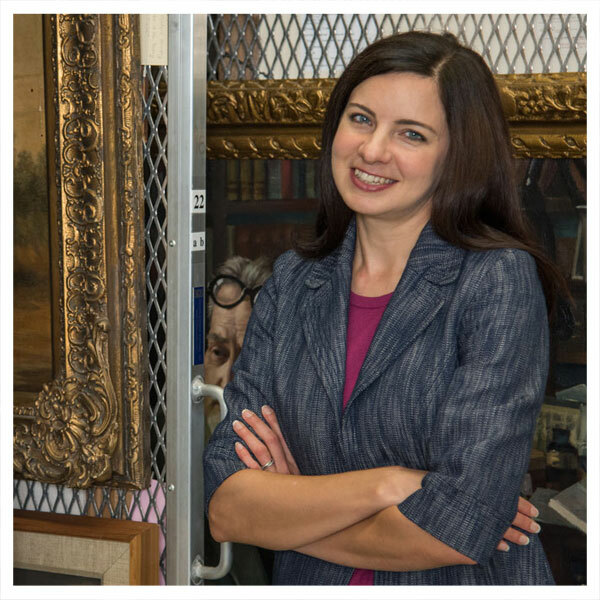 Tracy Bonfitto has joined the Ransom Center as the new curator of art. She has worked at the Getty Research Institute, the Fowler Museum at UCLA, and the Los Angeles County Museum of Art. She was previously a lecturer in the Art History Department at UCLA. Bonfitto is a specialist in modern and contemporary South Asian art. She holds a Ph.D. in Art History from UCLA, an M.A. in Museum Studies from the University of Washington, an M.A. in Asian Cultures and Languages from The University of Texas at Austin, and a B.A. in Anthropology and Humanities from the University of Northern Iowa. You have worked a lot with Asian culture, art, and language in different capacities. What sparked your interest in that area of the world? This might sound like an unexpected entry point to an interest in South Asian visual culture, but it was actually sparked originally by mid-twentieth-century American literature. Specifically, the Beat poets. In common with many young Americans, I guess, as a teenager I was very drawn to the works of Jack Kerouac and Gary Snyder. In different ways, both of these writers were very invested in exploring how East and South Asian literary, philosophical, and religious traditions might intersect with an understanding of the natural environment, the changing landscape of the United States, and shifting perspectives on post-war politics. From today’s vantage point, much of this landscape now looks quite different, of course—but it was enough to plant the seed of curiosity. In college, I took courses that explored intersections between religious practice and visual culture in South Asia, and that led me to UT and its strong South Asian Cultures and Languages program. In many ways returning to UT and specifically to the Ransom Center is coming full circle. I mean that not just in the sense of physically moving back to Austin, but also in terms of reconnecting with something I find incredibly valuable about the Ransom Center: the way the institution fosters encounters with archives and materials that spark unexpected new directions for scholars and researchers. You received your Master’s in Asian Cultures and Languages from UT. Did your experiences here draw you back to Austin? To the Ransom Center? The language training requirements in the Asian Cultures and Languages program are rigorous, and I found that to be a very positive and challenging environment for me. I enjoyed grappling with the puzzle that is Sanskrit, for example, and more broadly, with the sometimes-unexpected light that language training sheds on the study of visual materials. Language study at UT took me on my first of many research trips to India, and, given the cross-disciplinary nature of the department, I was constantly inspired and challenged by a wide variety of perspectives and methodologies. My advisor, Professor Martha Selby, was a key influence. Another highlight included translating the poignantly beautiful poetry of Mirza Ghalib in Professor Syed Akbar Hyder’s Urdu literature courses. I was a student at UT from 2002 to 2005, which was during the time that the Ransom Center was renovating its first and second floors. I remember seeing the Gone with the Wind material over at the LBJ Library when I first arrived at UT and being a bit swept up in the allure of that, which encouraged me to keep my eye on the changes taking place at the Center. When the redesigned space opened in 2003, it quickly became a place that I would duck into between classes. The Ransom Center is such a bright spot on the campus map for students and visitors, even if they are not here to conduct research. At UCLA you taught various classes in art history and research methods. What did you enjoy about teaching, and what surprised you about being an instructor? I really enjoy working with students, and I found that my undergraduate students at UCLA were constantly proposing and exploring new interpretations of artworks in my classroom. When you become specialized in any field of study, it’s very easy to slip into an overly narrow perspective. Hearing from students who are making connections across the disciplines and topics covered in their other classes outside of art history is often like a breath of fresh air. In my classroom, we focused on the relationships between art and colonialism, power, and contemporary globalism. A classroom of students coming in from a variety of diverse backgrounds adds so much more depth to the ways in which we grapple with those fraught topics than any single person could have ever arrived at on his or her own. That is particularly important to the subjects we were exploring. Working as a mentor with students as part of the Undergraduate Research Center, I was consistently inspired and impressed by the caliber of research and dedication of the students across the university. I worked closely with students as they tackled such diverse projects as the virtual reconstruction of a destroyed thirteenth-century medieval abbey, the meaning of urban space in the novels of Héctor Tobar, the challenges encountered by LGBTQ communities in accessing health care, and the effect of micro-loans on the home finances of families in North India. Many of these students reported back on the value of receiving close, individualized attention while attending a large major research university. The value for me was in getting a chance not only to teach but to learn from them. What is the most challenging part of being an art curator? There are many things to juggle at once, and all of us are so passionate about the artists and materials we work with that there’s a tremendous amount of internal pressure to do them justice. It’s a good problem to have, though. I feel incredibly lucky to be able to work closely with amazing objects and images that have already done so much and still have so many more stories to tell. Do you have any specific goals for your time at the Ransom Center? What do you hope to accomplish here as an art curator? In my short time at the Ransom Center I’ve discovered quite a few unexpected and compelling things: early prints by the American Regionalist Thomas Hart Benton, John Biggers’ lithographs related to Maya Angelou’s Our Grandmothers, sketches for the nineteenth-century Scottish author Robert Michael Ballantyne’s book illustrations, watercolors by the important Bengal School artist Abanindranath Tagore. Just to name a few! The collection is a gold mine for things like these. 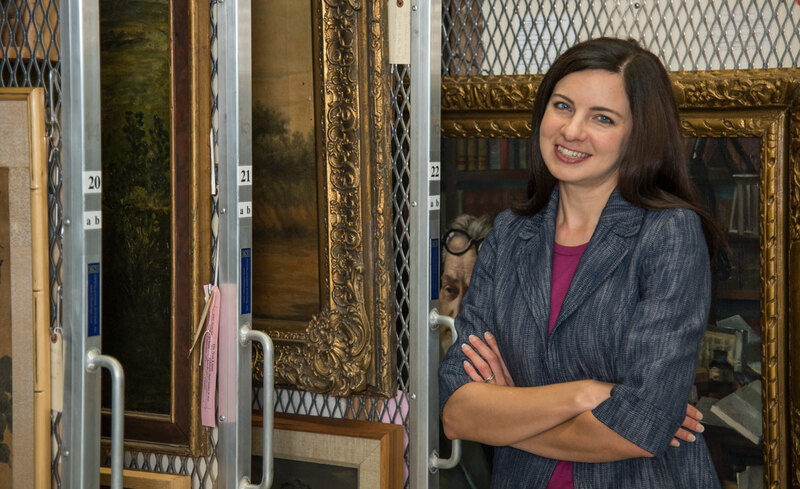 Part of what I look forward to doing is increasing the visibility of the art collection at the Ransom Center so that researchers and scholars can access our important holdings. I’m also keen to foster an environment in which students and visitors can be open to developing new lines of inquiry that they might not have pursued before. What is your favorite exhibition that you have curated? I’ve been fortunate to work on a number of interesting shows in a variety of institutions. As Textile Specialist at the Museum of History and Industry in Seattle, I enjoyed curating the local component of the traveling exhibition The Purse and the Person. The exhibition had a lighthearted feel—it was essentially the display of handbags from the late 1800s to the present day. But in addition to the changes in fashion and design on display was the evidence of significant social changes, the traces of which were visible in what might otherwise be thought of as a mundane accessory. It was an honor to work with Gunilla Knape of the Hasselblad Foundation to organize the 2013 exhibition of Ernest Cole’s photography at the Fowler Museum. Cole’s photographs are incredibly powerful, and work on that exhibition included the chance to engage with students in the difficult conversations surrounding apartheid. And although I was not the curator of this show, it was a pleasure to work with Making Strange at the Fowler in 2015. The exhibition brought together for the first time two earlier projects by Delhi-based artist Vivan Sundaram, and I loved seeing new dialogues unfolding as a result of this juxtaposition. I was able to spend some time with Sundaram, who was in Los Angeles for the installation—it was a wonderful opportunity after having spent so much time considering his larger body of work. Curators are often so passionate about what they do that it can sometimes feel that there is no “outside” of work! I love visiting museums and galleries, which of course very often segues into what I’m doing on the job. But beyond that I love getting outside to hike and explore, and look forward to getting back into seeing live music here in Austin. When I lived in Los Angeles I was a big fan of the UCLA Film and Television Archives events. They screen a lot of rarely seen films, some of which have been recently restored, and it’s always a treat to watch them on the big screen with a room full of enthusiasts who, in some cases, either worked on or have personal connections to the film. My husband is a fantastic cook, and I love to bake, so we spend a lot of time together in the kitchen.